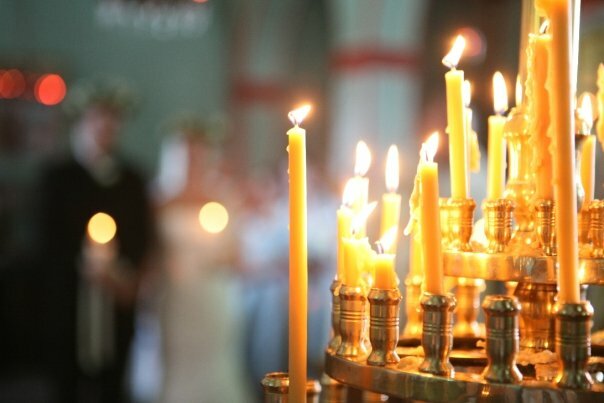 In the Orthodox tradition we light candles as an offering to God, and with each candle we say a prayer. 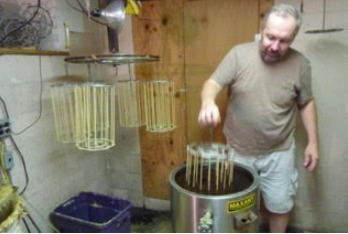 We started making our own candles on the property about ten years ago (2007). The candle shop, located in the basement of the Church, is a place where Fr. 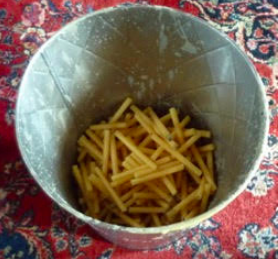 Spyridon or faithful parishioners spend time dipping and cutting the candles. This activity is one that provides time for prayer or listening to Scripture. 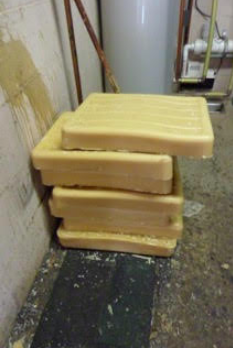 Bees wax arrives in blocks of wax. We melt down the candle stubs to make new candles. The first step in the process of making the candles is to collect the stubs of the used candles in the church. It’s important to note that just as we recycle cans, bottles, and paper in our homes, we also recycle the stubs of the old candles for two reasons. One is that it reduces the need for new beeswax, and it’s cost, and the other is that all the candles were originally lit with prayers by an Orthodox Christian, so by recycling the candles stubs, those prayers are regenerated yet again in a new candle. 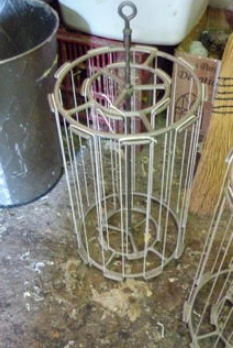 The next step in the process is to wind the cotton wick string on the metal candle form spindles. Each form has 28 wick strings. 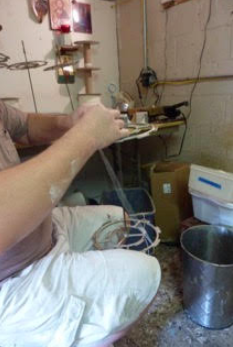 Vladimir, our current candlemaker, at work. 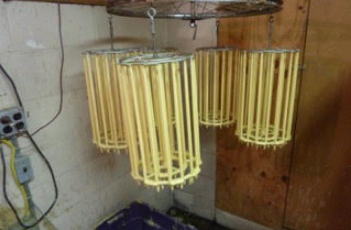 Six of the forms with the wicks strung on them are then dipped quickly in and out of 15 gallons of 180 degree molten beeswax, and then hung on a wheel to harden. The forms are dipped 8 times to get to the size of the candles available in the church, and many more times for thicker candles. 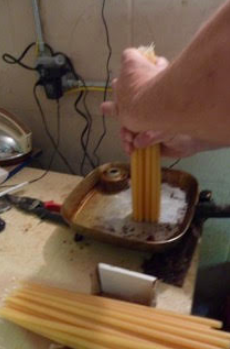 When the candle dipping is done, the candles harden over several hours or an overnight, and are then clipped from the forms using scissors, and the ends seared in an electric hot plate to finish the ends. 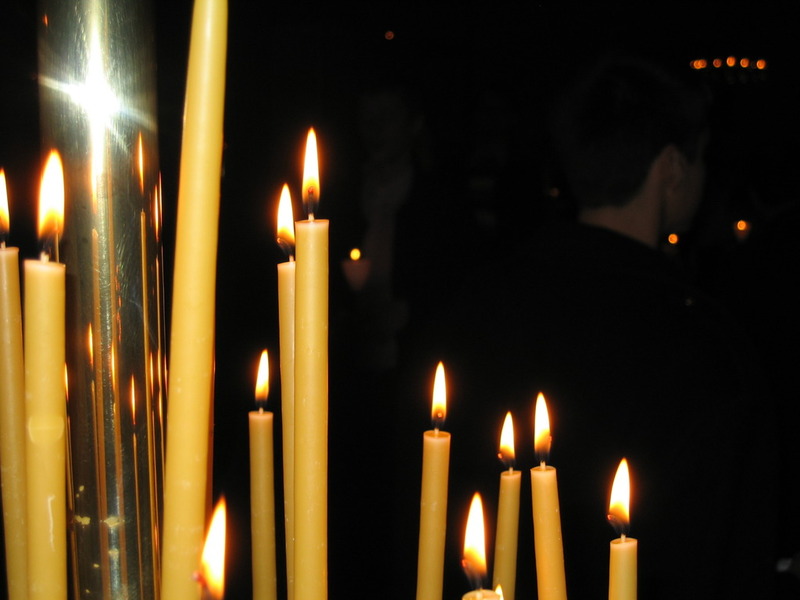 When entering an Orthodox Church many notice the beautiful candles lit around the Church, typically next to an icon. 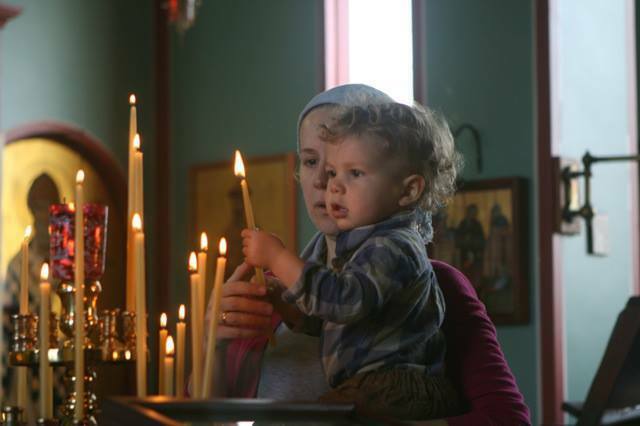 It is a tradition in the Orthodox Church to light candles, in order to pray for others or to say a prayer asking for help or guidance for oneself. Christ said, “I am the light of the world; he who follows me will not walk in darkness, but will have the light of life.” (John 8:12) Jesus Christ is our light and he shines for us in the midst of this world. Each time we light a candle, we are called to remember that it is our Lord and Savior Jesus Christ who is the True Light and that He and only He will grant us True Life. In lighting our candles, the first thing we should do is make an offering for this candle. Everything that we have is from God and the first step is to give back to Him for all of His many blessings. The next step is to venerate the icons that guard the candle stand and lift our prayers to God on high. Next, we light the candle, remembering all of our loved ones who are sick or who have passed into the next life, or who we just want to pray for, and beseech God to have mercy on their souls. Modified from: stgeorgepa.net "Why do we light candles?"